Registrer Now: 2019 Greater Fairfax Homeschool Geography Bee! Calling all geography buffs and enthusiasts! Registration is open for homeschooled students to participate in the annual Greater Fairfax Homeschool Geography Bee. 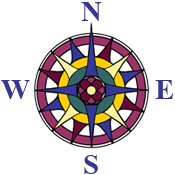 Compass is a host site for this “school level” contest for the 2019 National Geographic Bee. The school level winner will take a written test to be invited to qualify for the state level bee in spring 2019.